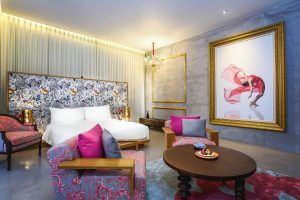 Shanghai, China, May 27, 2016 /ChinaNewswire.com/ - AccorHotels Luxury & Upscale brands proudly open the new 77-room SO Sofitel Hua Hin in Thailand, the first SO Sofitel resort in Asia Pacific. SO Sofitel Hua Hin’s ‘Imaginative Escape’ concept combines the destination’s beachside style and the resort’s soul. Hua Hin has long been known as an aristocratic retreat – making it the perfect destination for luxury accommodation with a sense of refinement and a nostalgic seaside charm. Conveniently located just a two-and-a-half-hour drive from Bangkok, SO Sofitel Hua Hin will especially appeal to design enthusiasts and trendsetters hoping to escape the hustle and bustle of the city. The resort also features private access to Cha-am beach. Energetic, social and bursting with character, SO Sofitel playfully combines sophisticated French elegance with the dynamic style of each hotel’s locale. Each SO Sofitel is an avant-garde masterpiece inspired by and featuring the work of a signature fashion designer: Kenzō Takada at SO Sofitel Mauritius, Karl Lagerfeld at SO Sofitel Singapore and Mister Christian Lacroix at SO Sofitel Bangkok. Since opening in 2012, SO Sofitel Bangkok has become a marquee destination for international travellers and locals alike, drawn to the urban hotel’s stunning design, beautiful views and stylish restaurants and bars. Following such success, SO Sofitel Hua Hin is poised to become the next sought-after resort destination. The resort benefits from the creative signature of fashion designer Polpat Asavaprapha, the founder and creative director of ASAVA, a brand that reinterprets classic timeless style for the modern woman. Prior to creating his own brand, the Thai designer and fashion icon gained a wealth of experience working for names such as Marc Jacobs, Isaac Mizrahi and Max Mara, and serves as President of the Bangkok Fashion Society. Guests will notice the designer’s pronounced playfulness and attention to detail throughout the property in his signature sophisticated urban artwork as well as the SO Sofitel Hua Hin uniforms and emblem “The Butterfly Effect”. Award-winning Thai architect Duangrit Bunnag created the resort’s original bold structure, featuring an interwoven maze of open courtyards and private pathways. The property’s geometric lines and solid shapes, softened by a palette of naturally aged woods that blend with the beauty of the surrounding nature, create an environment of contemporary tranquillity. Painting the canvas is Donatien Carratier, who brings to the new resort over 20 years of design experience in Asia. The forward-thinking interior designer, who focuses on luxury projects that demand iconic styling, is famed for creating deeply resonant environments in which vivid dreams blur with reality. Drawing inspiration from the Grand Gallerie de l’Evolution natural history museum in Paris, he is the visionary behind SO Sofitel Hua Hin’s ‘Evolution of Life’ theme, which begins with friendly animal statues that greet guests on arrival and proceeds to wild animal sculptures around the reflecting pond and rabbits hiding throughout the resort, literally putting a whimsical surprise around every corner. For the private spaces, Donatien developed two vibrant room styles: SO Nature and SO Arty. SO Nature rooms are a mix of simple natural elements and lavish French refinement, providing a relaxing environment that is in line with Mother Nature, showcasing the acclaimed photographs of New Zealand environmental artist Martin Hill. The elegant SO Arty rooms blend the sophistication of the past with chic, contemporary design. These rooms offer an atmosphere of dreamlike luxury, featuring the award-winning work of American photographer Lois Greenfield, known for her distinct approach to capturing the human form in motion. Designed around its eponymous white oven, White Oven restaurant serves authentic Thai cuisine exquisitely revisited to showcase the gifts of the garden, the sea, and the artistry of the chefs. HI-SO, the picturesque and panoramic rooftop bar is a place to chill, socialise and Instagram photos of the magnificent view while sipping cocktails crafted by a master mixologist. Within steps of the ocean, the playful and lively Beach Society serves à la carte beachside bites for a lazy day and seafood BBQs – all superbly crafted from the finest and freshest local ingredients. Complete with stunning sea views, this is the venue for not-to-be-missed beach parties and the new place in town to see and be seen. For guest wellness, the resort offers SO SPA and SO FIT, as well as two pools – the adults-only Solarium Pool and family-friendly SO Pool. The SO Ballroom is equipped with cutting-edge audio-visual equipment and integrated smart solutions for business meetings and company outings, as well as lavish galas and weddings for up to 150 guests. Each of the 77 rooms including six SO pool villas features flat-screen TVs with interactive DirectStreams programming, a Mac Mini from Apple, and complimentary local goodies and drinks. Last, the art Galerie will feature exhibitions from local and international talent, focusing particularly on up-and-coming artists. The exhibitions rotate every three months and offer guests a quiet moment to appreciate art. SO Sofitel, AccorHotels’ sparkling brand, offers international travelers and cosmopolitan residents the ultimate blend of French audacity and local color. SO Sofitel’s hallmark sociability and epicureanism, as well as its youthful dynamism and cosmopolitan identity, attract eclectic, festive guests. In Bangkok, Singapore, Mauritius and Hua Hin, SO Sofitel offers a unique experience, with its unmistakable avant-garde designs, state-of-the-art technology and amazing events.